Anyone who has explored the neighborhoods of St. Louis knows that its urban fabric contains immense charm, largely due to a proliferation of high quality historic buildings and interspersed mid-century modern structures. These historic structures help present St. Louis as a world-class city, and are an undeniably vital part of the narrative of the city. This fragile and nearly irreplaceable historic fabric, with very few exceptions, should be preserved however possible. In many of our historic neighborhoods, this preservation has been accomplished, in part, through historic district designations and their associated historic standards. While the standards have often been successful at restoring and preserving existing construction within neighborhoods, they have largely been unable to create worthy replacement of the lost portions of historic fabric. The fundamental flaw in the process is the requirement that new construction adheres to historic standards. While noble in intention, this practice often results in the proverbial mullet houses or snout houses, and usually bearing little historical accuracy. Creating replica versions of historic neighborhoods ultimately doesn’t honor them, but instead it detracts from them. Worse yet, it cheapens them. World-class historic buildings deserve adjacent infill that is respectful enough to be original. The Flounder House, showing what we could see if we allowed the new and old to exist side, by side. Rather than try in vain to recreate the lost portions of historic fabric, a new layer should be added to the city’s built history- one that addresses the problems of the 21st century instead of replicating the forms of centuries past. The freedom to directly deal with evolving issues is ultimately a quality-of-life issue, but it’s also one of aesthetics. The resulting juxtaposition of the modern and historic is arguably the most material way for a rejuvenated urban core to exemplify positive change. There is a vibrant synergy that results when buildings of different eras share a street wall. They highlight each other’s unique qualities, and their history and stories play off of one another, both visually and rhythmically. This dynamic quality is usually desired in a city, yet is formally prohibited in many of the city’s most attractive neighborhoods because of the restrictions imposed by historic districts. The Flounder House would be located within the Benton Park Historic District, and therefore would be held to the historic standards for new construction. While its aesthetics are modern, the design maintains the density and contributes to the rhythm of the historic fabric. “It is not the intention of these regulations to in any way discourage contemporary design, which through careful attention to scale, materials, siting and landscaping is harmonious with the historic, existing structure. Distinctive older buildings are not enhanced when new construction, which resorts to ‘fakery and imitation’, is used to fill gaps in the streetscape.” – the Central West End neighborhood historic standards. Historic neighborhoods are great places because the buildings are authentic and their character and details sprung organically from their own particular time and circumstance. These buildings are real and you know it when in their vicinity. They exude an authenticity that simply can’t be recreated through cheap imitation. As St. Louis continues to struggle with population loss, its elected leaders search for solutions to various interrelated problems. 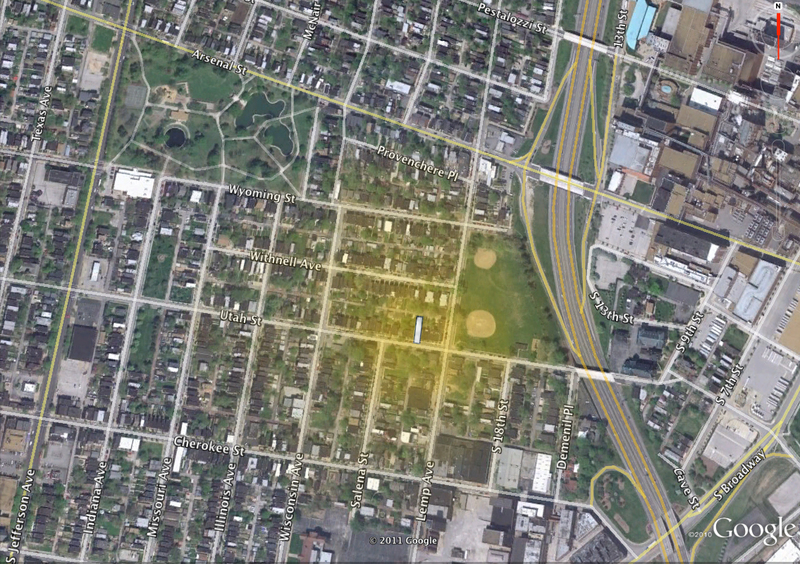 St. Louis needs to look in the mirror and analyze the reflection of what it truly is: an evolving place that will never again be the intact, historic city that once housed 850,000 people. It’s tragic how much of the St. Louis urban core has been lost to both outward migration and senseless demolition, but the extinguished historic buildings are gone and can’t be authentically recreated. With the number of vacant buildings in St. Louis, it is evident that there is not a colossal demand for historic properties- at least not enough to continuously foil the wrecking ball. It should then be obvious that to mandate building new ‘historic appearing’ homes, while real historic homes crumble only blocks away, is needlessly counterproductive. With this realization, a review of the terms for new construction within the historic neighborhoods of St. Louis is warranted. Alternatives are needed. Modern infill should not only be allowed, but should be encouraged. The improvement to quality of life would be palpable. 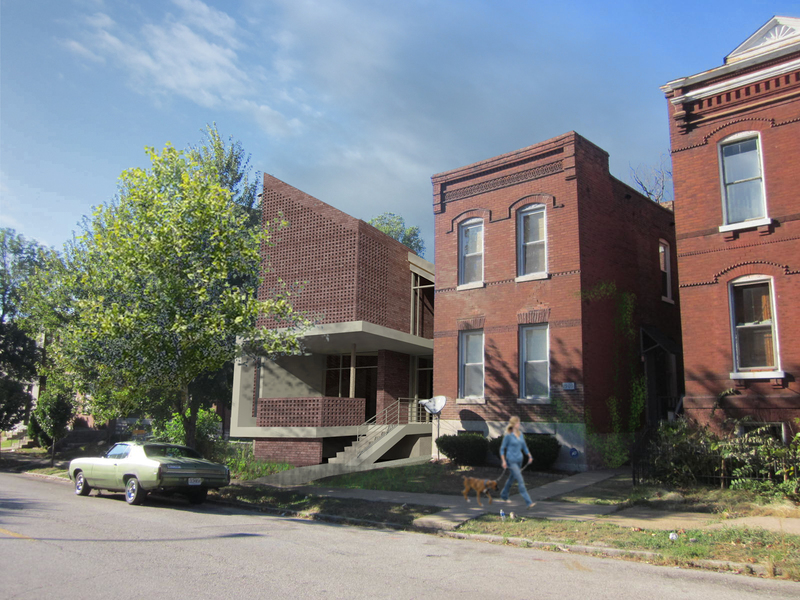 The Flounder House is an example of contextual modern infill and is a direct reference to a common housing form mostly unique to early St. Louis, with examples still found around St. Louis’s oldest neighborhoods. Its distinctive half-gabled roof gives it its character, and can be described diagrammatically as a brick volume with a long sliver of exterior circulation. 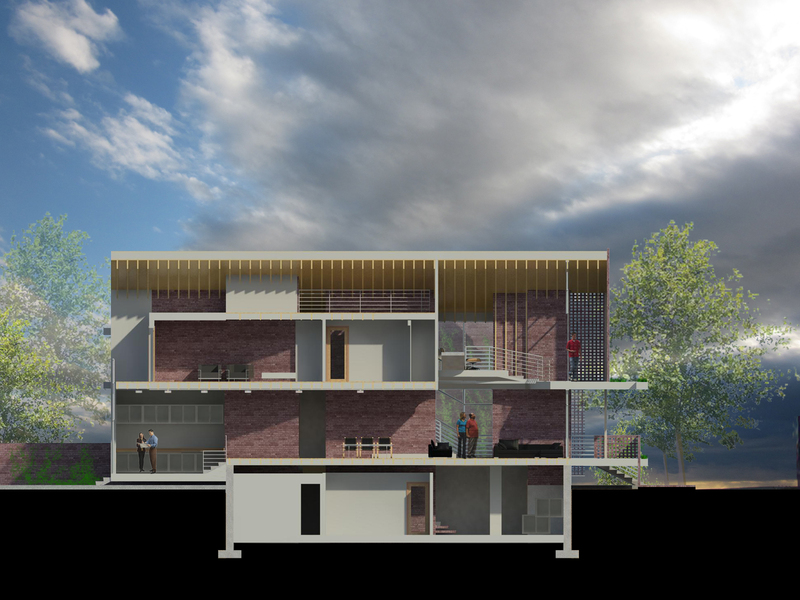 Here, the design extrudes the circulation corridor through the building, dissecting the minimalist brick screen façade to create a roof deck within the brick screen and a community friendly front porch below. 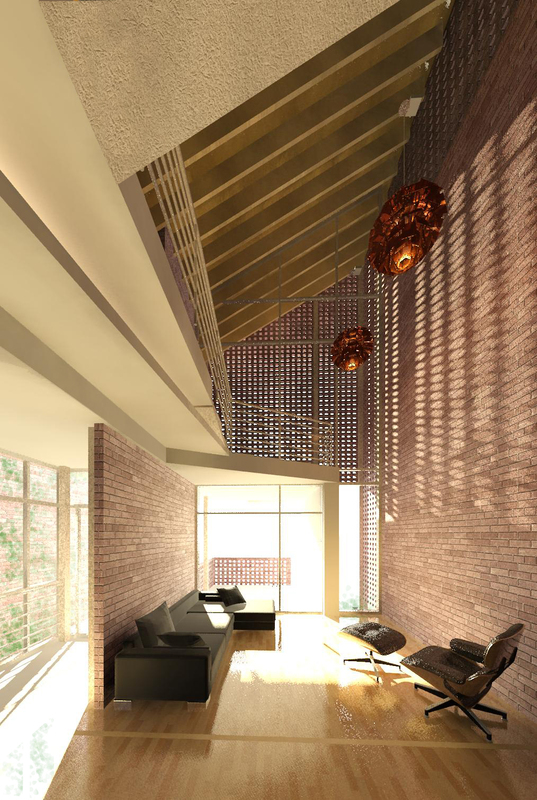 The 2nd floor bedrooms and 3rd floor loft space manifest as a sculptural element that playfully interacts with the circulation and brick massing. Through juxtaposition, modern infill frames historicism- it proudly displays both our past and future as something equally special and deserving of respect. 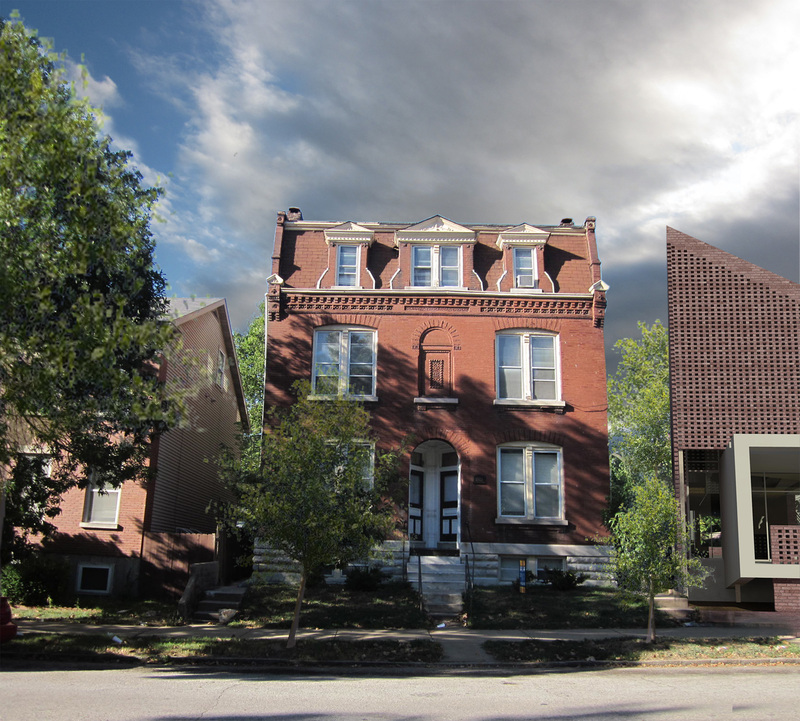 Well-designed modern infill that respects its historic context through massing, materials, and detailing can provide St. Louis with a jumpstart to a most diverse urban landscape. The possibilities of modern design celebrate the present, and show that even with fewer inhabitants than in decades past, St. Louis can expect its best days ahead. Shown here on the winter solstice, the brick screen creates an ephemeral ambiance that changes hourly and seasonally. As a theoretical project, this modern flounder house has not been subjected to the critical review of the local Cultural Resources Office. Though the design cares to respect its context, it would certainly not be approvable by authorities having any jurisdiction over new proposals because it is not based on an appointed, model example. One must wonder if such a system of prescribed cultural conservatism is stultifying St. Louis neighborhoods. This building section highlights the fluid spatial connection between various tiered interior and exterior spaces. The possibilities for non-traditional spatial layouts are either outright prohibited, or significantly hindered by current historic standards for new construction. New buildings can satisfy the criteria that respects historic context without trying, falsely, to appear historic. 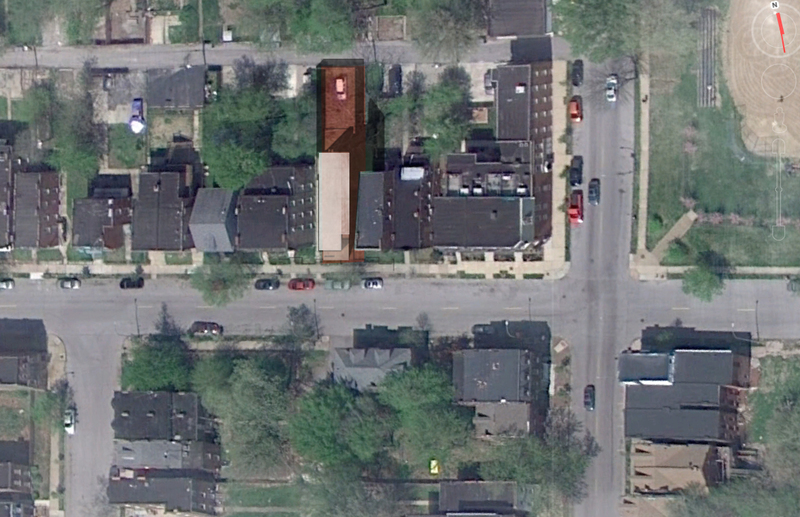 Model example or not, the Flounder House would satisfy most of the requirements of the Benton Park historic district standards for new construction. These matched standards include site alignment, setbacks from rights-of-way or property lines, massing, scale and proportion. 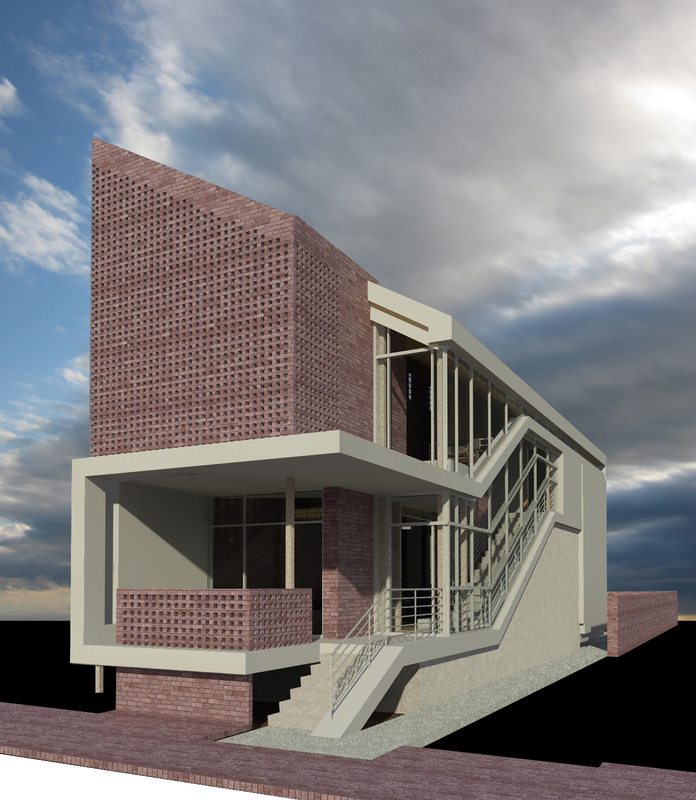 The façade is composed of an approved material in brick, and has an appropriate mass-to-void apportionment. A truly historic building is flanked by both a cheap historic imitation and the Flounder House, which reinterprets a historic housing form through a modern lens. These reinterpretations, when in contrast to authentic historic detailing, add richness to the street that is impossible to replicate with only buildings of the same era. As soon as one becomes divorced from the restrictions of model examples, countless possibilities open up for innovative solutions that can meet the needs of a 21st century society- functionally, socially and aesthetically- all while respecting their historic context. Most solutions won’t have an explicit historical reference, nor should they. Through the well-known concept of form-based zoning, proper massing, materials, sense of scale and quality of construction, we can readily assure compatibility with the historic architecture of St. Louis neighborhoods. Buildings of different eras narrate the history of a city’s built environment. St. Louis has a rich and vast history that should be preserved and celebrated however possible. Yet ultimately, the story will stretch far beyond this rich history. St. Louis is awakening and jumping headfirst into the 21st century. The evolution of her built environment should celebrate this awakening. An inclusive evolution won’t happen through demolition or replication, but instead through adaptive reuse, invention and thoughtful modern infill. Perceptions matter, and the way to shape them should be through the adjacency of well-designed contemporary buildings and revitalized historic buildings. While a dynamic eclecticism certainly won’t happen over night, it should be the clear, ultimate goal. As a quality of life issue, the successful marriage of modern infill to rich history is obvious, but it also demonstrates a truth: St. Louis was once great, and still is. Really like this concept, and I fully agree that the obsession with maintaining a “historical” neighborhood everywhere is counterproductive. I live in a 1930s gingerbread, and I HATE it. The constant maintenance headaches and weekends of work are draining. I love living in the city, but require new construction for my next house. I don’t want to deal with a rehab or anything of the ilk. I completely understand your perspective! And you really shouldn’t live in a historic neighborhood with these menacing old buildings to deal with. I suggest you ask them to build this wonderful new building over the raised wreckage of your 1930’s headache! Then everyone is happy. And I hope you can respect that I live in an 1860s restoration that I love. And I love that every building on my block is built with the same aesthetic in mind. I devoted half of my life to the preservation of this neighborhood fighting the demolition of historic buildings and protecting what we in Benton Park view as a significant resource. How do we feel about the notion that neighbors have a right to influence what is built around them when it is their resources and dreams that brought them to th neighborhood in the first place? From an architectural perspective, this design defies the notion that buildings exist within their context. Not that design is bad – but the designing of the building’s placement lacks sensitivity. Other than one infill (which attempts to maintain the design scheme of the surrounding buildings, there is not a single structure in the surrounding four blocks which was built after 1910. And over 80% pre-date the 1880s. This is post-modern design irresponsibility in the clothes of ‘becom[ing] divorced from the restrictions of model examples”. Your first paragraph’s tone destroys the good content of the next three. Too bad. you are not putting that monstrosity across the street from me. I will fight this with everything I have! Well – I can hope that you and others will read beyond the intense emotions of a man who has committed his life to this neighborhood. Or perhaps better, read those emotions as valid – even if the vitriol is unprofessional. They speak to a personal investment. I began working with this neighborhood, on a number of levels, in 1988. I hope this can help to illustrate why this proposal struck me so adversely. This proposal is only hypothetical, as are all of the projects suggested as solutions to perceived problems within the St. Louis region in this blog. The point of the proposed project is to both illustrate a respectful allusion to a recognizable residential form (the flounder), and present an argument for cohesion of neighborhood character when diversity is permitted. Your spirited response is very indicative of the sort of cultural conservatism that frustratingly only seems to embrace the beautiful, and mostly irreplaceable artifacts while resisting the inclusion of what would promote the progression of this city’s ongoing story. Thank you for obviously caring enough to share your view, and while you seem to have personified the stick-in-the-mud stubbornness that historic codes are imbued with, the ultimate purpose of this blog is to allow for such commentary. We can all have opinions of ‘what should be’ in a particular place and time. All- Benton Park neighbors adopted its Historic District Ordinace about six years ago. New construction and/or major renovation requires that the design be based on a model example. I will share with the readers that the group spent over two years researching, writing and building concensus for the historic district. 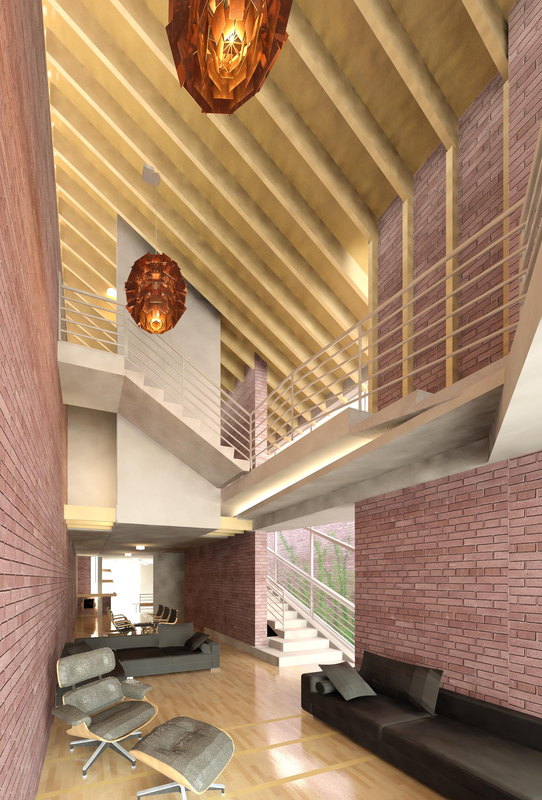 Two aspects of this were most difficult- the concern of gentrificaiton and incorporating contemporary design. While the first is handled with the historic district ordinance, trying to prepare a code that dictates good taste and respectful design aesthetics proved to be a spliting point. In the end, replica housing based on model example had proven to be enforcable in other districts and neighborhoods using the “model example” requirement (e.g. Soulard, Lafayette Sq.) These neighborhoods adopted these long before Benton Park and have gracefully maintained their 19th century charm and would be termed on many levels successful. The flounder structure presented above is certainly intriguing. As with my neighbor Mark Sarich, I too have spent over half my life trying to educate neighbors and citizens on the resource we have. Someone recently asked me what I like most about Benton Park was seeing all the old buildings getting “fixed up”. I replied that the “fixed up” buildings was actually second on my list- by my friend’s puzzled look I finished my answer— What I love seeing more than century old buildings and houses “fixed up” is the young people buying them and becoming part of Benton Park neighborhood. Like John & Jason, I appreciate this post for its willingness to stand up and say that buildings should be of their time, but still respecting the context in scale and material. I think Jeremy might be surprised by the willingness of Cultural Resources officials to approve such a thing – if the support of neighbors (like Mark) can be won. It makes me wonder how much of the design of the urban infill we see is based on satisfying those critics, to the point of banality. ,,,which is a zero sum game. Historic codes seem to create a life-size museum diorama of a scene frozen in time, much like something depicting a famous battle or some other momentous event recorded in the annals. Why does the protection of existing and irreplaceable historic neighborhood artifacts, and encouragement of building in the style of that neighborhood have to preclude other expressions of building? Land development, to me, is much more a matter of sensible form that breeds manifold layers of vitality, and much less a matter of subjective style, but I have to say that I also respect the reasoning behind the creation of a protectorate by way of historic code. You can choose to live in a life-size diorama by playing the part.